Soak the raisins or cranberries in a little bit of rum and set aside. Briefly microwaving the berries and rum will accelerate this process. In a blender combine the milk, oil, sugar, salt, and the egg yolks until smooth. Pour the wet mixture over the flour in a large bowl and thoroughly combine and set aside. Beat the egg whites until soft peaks form, then carefully fold into the batter. Melt the butter in a large non-stick skillet over medium heat. Pour in the batter and then top with the rum soaked berries and almonds. Let the batter cook partially until the bottom is golden brown (use a spatula to peek), and then dig in with your spatula and tear and toss the batter into pieces. Make a mess! Fry until golden, but not over cooked. Depending on the size of you skillet, you might find it easier to cook this in two separate servings. 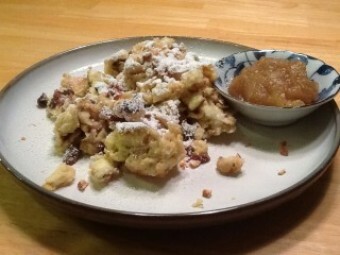 Serve with a liberal dusting of powdered sugar, and serve with applesauce. This is a traditional dish in parts of Tyrol (Austria) and Bavaria (Germany). It can be eaten as the main course (a great late night meal), or as dessert - anytime. It's great comfort food.